It is not every Monday morning that you have the opportunity to meet amazing people doing amazing work. And it is not every day you get to meet wonderful women, who are showing determination, bravery and real hope for the future even through some of the most devastating experiences life could bring. The first partner I got to meet during my very first visit to Ethiopia is AWSAD, the Association for Women’s Sanctuary and Development. AWSAD runs a crisis centre for women and girls in Ethiopia, providing a refuge for victims of gender-based violence and discrimination, harmful traditional practices and exploitation. They also offer legal advice, health services and vocational training, as well as delivering training to community and government institutions, such as the police forces, to enhance their capacity of providing quality services to victims of gender-based violence and exploitation of women and girls. Maria, founder and director made us feel welcome since the moment we crossed their gate: water, tea and biscuits accompanied a thorough presentation of the work of the organisation during 2016, together with its successes, such as the opening of new safe houses outside of Addis Ababa, but also with the endless challenges they face when providing a multi-faceted service to young girls and women, who have been affected by violence. We were then honoured to be welcomed in one of the safe houses, where we were introduced to three young survivors, who very kindly shared their heart-breaking stories. It is hard to imagine a world where anyone has to endure such level of pain, violence and abuse – but it is a reality, and that is why there is such demand for the services AWSAD provides. Currently their safe houses are at full capacity and more – the one we visited hosts 79 women and 37 young children. Numbers confirms that there is no denying they need ongoing support. Even through life hardships, the group of young children and women welcomed us with dances, singing, a beautiful coffee ceremony, a hand-made card from the young children who attend classes in the house and few hand-made presents by the very same women we seek to support. The spirit and genuine warmth was overwhelming, nevertheless I felt truly uplifted. A feeling that is accompanied by the certainty that Ethiopiaid support to AWSAD is truly in aid of some of the most vulnerable people in Ethiopia and it is a partnership we are very proud of. 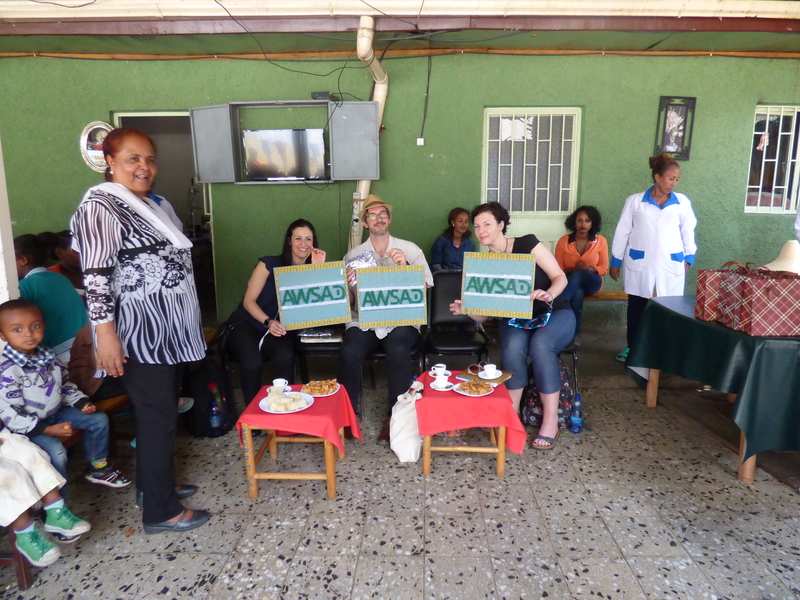 Olivier Bonnet (Ethiopiaid Canada), Eufemia Solinas (Ethiopiaid Ireland) and Lisa Cousins (Ethiopiaid UK) Directors with Maria Munir (AWSAD), during visit at AWSAD. / Tailoring Vocational Training for young women run by AWSAD. This is the second of several posts Ethiopiaid will be sharing after each partner visit while in Ethiopia. Every year, as part of our monitoring and evaluation process, the directors of Ethiopiaid Australia, Ethiopiaid Canada, Ethiopiaid Ireland and Ethiopiaid UK travel to Ethiopia to meet with our partners to make sure we are creating lasting and effective change and that your donations are well spent. Watch this space for more blog updates!